Descubra a beleza das antigas ruínas maias nesta viagem noturna de Copan e Quirigua da Cidade da Guatemala. Seu guia especializado irá buscá-lo em seu hotel na Cidade da Guatemala e transportá-lo através de paisagens cênicas até a fronteira de Honduras, onde você viajará para o local de Copan, considerado Patrimônio da Humanidade pela UNESCO. Explore as ruínas antigas com seu guia, que compartilhará informações e informações sobre as vidas dos primeiros habitantes da Guatemala. Passe a noite em um hotel local e desfrute de um café da manhã de cortesia com seus companheiros de viagem antes de embarcar em um passeio por Quirigua - localizado a cerca de 50 quilômetros de Copan. Passeie pelos pilares de pedra esculpida, praças e outras ruínas antigas e aproveite para saborear um almoço local (por conta própria) antes de voltar para a Cidade da Guatemala. This is an amazing trip in theory. I think it would have been a much better trip if I hadn't been the only person on the tour. As it was a spent a lot of time in a van with the tour guide who I didn't really jive with, i am sure he would have been much better if there had been other people with me. It takes a lot of time in a vehicle to get to each place which I expected since that was clear in the description. The guide flipped the order of the stops so we had more travel time on the first day and only really stopped to visit Quirigua and got to Copan Ruinas after dark. The hotel there was amazing and very comfortable, with a very nice breakfast. 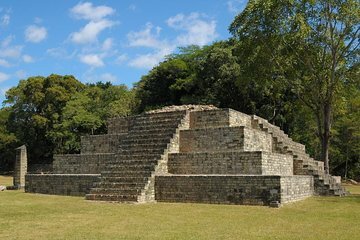 Due to protests I didn't actually get to see Copan so I cannot comment on that part of the scheduled tour. I instead listened to a lecture in French about it French isn't a language I have used in 11 years and didn't learn as much as i had hoped. I did see macaw Mountain which was beautiful and the birds were a unique experience but it isn't what i had paid for or planned to see. So, really I would only recommend it if you are travelling as a group or at least a duo and I hope you get to see the things you had planned and paid to see. This was a wonderful trip, there were just two of us and our guide Mirko who was very knowledgable. The Copan ruins are great we had a guide called Gladys who explained what the various buildings and carvings represented, and the history of the city and the kings. The temple is very large as it has been built over many times the ball court is interesting as you can imagine the games taking place.There is a staircase covered in a tarpaulin but it is possible to see the glyphs carved into the risers .The marina hotel in Copan was lovely with pretty gardens our room had a terrace at the rear which was full of plants and flowers there is a pool, the breakfast was a very nice buffet. We also had supper in the hotel.the hotel is in the middle of the town. The trip to Quiriga was interesting there are many stellae which are in their oroginal places the space is very big , not all the buildings have been un earthed due to the trees growing in themThe museum is small but quite interestingand jade shop were good.there is a lot of driving involved, but I would recommend this tour. Crossing the border was easy there is a tax at both borders, and you get your passport stamped in Honduras, when you return it is straight through. Very very nice trip, excellent guide, was everytime looking about us. Our van did not have air conditioning and it was many hours spent in the van on days where the temperature reached 90+ degrees. Needless to say this made us tired and cranky. Copan and Quirigua were great sights. The hotel was excellent.We didn't get lunch until 3pm on the second day.